"When I'm done, we'll be looking for a needle in a haystack. But if we stop now, it'll be a hundred thousand haystacks." Wars are not fought only by those on the battlefield. There are those who fight behind the lines of combat, using their keen intellects to serve their country, not guns and artillery. Like the soldiers who serve in the field, these individuals contribute vital components to a war effort, yet their heroism and accomplishments are never featured on a recruitment poster, or in a newsreel. 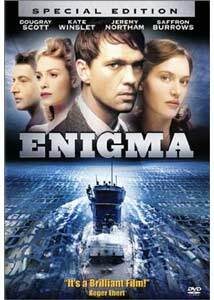 These men and women are the intelligence officers, covert operatives, and in the case of Michael Apted's Enigma, the codebreakers. In early World War II, America's assistance to the war in Europe came in the form of shipping; Convoys filled with American goods made their way across the treacherous north Atlantic, attempting to supply the men and women who faced Hitler's Third Reich head on. However, this venture turned out to be more treacherous than any one feared. Hitler's U-Boats, like wolves to the herd, ravaged the helpless convoys, making mincemeat of men and goods. These U-Boats, and the entire German Army, depended on the Enigma machine to communicate in complete secrecy. This sophisticated device turned "plain text into gobbledygook," rendering any interceptions of such transmissions unreadable. There was no sure defense against the U-Boat aggressors-until the codebreakers entered the fray. This is the setting of Michael Apted's (Enough, The World is not Enough) film, Enigma, adapted by accomplished screenwriter Tom Stoppard (Shakespeare in Love, Empire of the Sun) from the novel by Robert Harris. The film is a detailed look at a group of elite British codebreakers working out of Bletchley Park, a secret mansion that was the center of British codebreaking operations during WWII. The work that went on in the Park was kept secret for decades after the war. Aside from a compelling, factual exploration of the men and women who made such operations successful, Apted's film centers on a fictional story of "love, espionage, patriotism and betrayal." As expert codebreaker Tom Jericho rides a train bound for Bletchley, he is a man haunted by what he has left behind. In a haze of emotional turmoil, he approaches the Park, where he previously broke "Shark," the ultimate code used by the Nazi U-Boats. Jericho is recovering from the "Romilly Effect," a period of brief insanity caused by his relationship to Claire Romilly (Saffron Burrows). He has been called back to recover the Crown Jewels-The Nazis have changed their code, and the British have lost "Shark." Bletchley Park is enshrouded in secrecy. All those who work within its ivy peppered walls must keep their jobs secret, even from other Bletchley workers. If the Germans changed the code, someone must have told them. Is there a spy in Bletchley? Detective Wigram (Jeremy Northam) is sent to the Park to determine just that. In the process, Claire goes missing, and Jericho, obsessed with the relationship he left behind, teams up with Claire's quiet roommate, Hester Wallace (Kate Winslet) to uncover what happened to her. While Jericho is charged to break Shark before another convoy is decimated, his "amateur sleuthing adventure" with Hester leads to discoveries of betrayal, love, and misplaced loyalties. The plot has multiple threads that intertwine wonderfully, and maintain plausibility. This showcase of British talent is a well-executed film, and despite its unique structure of flashbacks, does not become too complex for its own good. Even though there are moments of intense action, this is an intriguing character study. Apted expertly balances past events (through flashbacks with a distinctively different visual style), with the current investigation by Tom and Hester, and the relationship that results. Also, the codebreaking operation is illustrated with great finesse, showcased by well-edited, tense sequences of the codebreaking process. Apted also chooses to develop distinct personalities among the reclusive, brilliant minds in Bletchley-Tom's support staff is an intriguing collection of individuals, each with their own talents and tendencies. Performances are first rate. In a complete 180 from his evil persona in John Woo's Mission Impossible 2, Dougray Scott creates a distinct character whose pale fa�ade and brooding introversion effectively denotes his intellectual brilliance. Kate Winslet's also gives a charmingly quirky quality to Hester Wallace, whose unique personality eventually appeals to Jericho, who is initially obsessed with her former roommate. Winslet personifies the strong, independent woman of the period who, despite her intellect (which equals that of the codebreakers), is banished to being a "glorified file clerk." Jeremy Northam's Detective Wigram is decidedly slimy, seemingly two steps ahead at all times. Finally, Saffron Burrows brings an almost angelic quality to the character of Claire, who becomes the true enigma of the story. Overall, this is a well-done, overlooked film that was released independently, and produced by none other than Rolling Stones frontman Mick Jagger and SNL producer Lorne Michaels (an odd combo). Apted's direction and visual style is solid, and a great period feel is established. Despite some explanation via dialogue at the end , the plot is engaging, complex, filled with twists, and blends aspects from several genres to great effect. Characters are allowed to develop and flourish, defying stereotypes, though some may feel they go over the top. Topped off by a somewhat standard, yet effective score from legend John Barry, this is a remarkable film. Columbia has wisely chosen to reissue Enigma on special edition DVD-a release marked by great improvements over its lackluster, barebones predecessor. Image Transfer Review: Columbia's first release of Enigma was marred by a rather low quality anamorphic transfer, considering how new the film was. Heavy grain, video effects and lack of detail marred the film's expert cinematography. The transfer appeared to be converted from a different format, possibly PAL. Thankfully, this new reissue makes the previous release a bad memory. The new 2.35:1 anamorphic transfer, "re-mastered in high definition," is full of detail and grain is minimal. The subdued color palette is faithfully reproduced, blacks are solid, and the image has a very natural, film like appearance. Minor edge enhancement occasionally appears around titles and characters, when placed against a bright background. Overall, a great transfer. Audio Transfer Review: The Dolby Digital 5.1 mix sounds identical to the previous release, which had no audio problems. This is a very natural mix that is mostly front-heavy, but has a nice sense of spaciousness. The surrounds are put to use for environmental ambiance and minimal directional effects. John Barry's score also bleeds a bit into the surrounds, which fills the soundstage nicely. LFE is present when needed, but does not call attention to itself. Since this is a dialogue heavy film, a mix of this nature is to be expected. Overall, a natural soundtrack that is well suited for the film. The best new extra is a feature length commentary with director Michael Apted. This is one of the most engaging tracks I have heard in a while. Apted discusses nearly every facet of the production, beginning with the struggle he went through to bring the film to the screen. Adapting the novel, casting, and finding distribution for the film were some of the major hurdles Apted faced, and he discusses each of them in detail. He also explores some of my favorite aspects of filmmaking: The technical choices made during the course of the film. Cinematography and lens choices are discussed, along with the challenge of editing such a complex story without losing the audience. Finally, Apted explores some of the real life history surrounding the largely fictional story. A great track. The disc also contains two informative documentaries. The first, Putting it all Together is a 20 minute piece on the making of the film itself. It features interviews with the major cast members, the director, and even producer Mick Jagger, decked out in a British uniform (look for his cameo in the nightclub scene)! The documentary contains some good information, and goes beyond the usual EPK piece, but is composed almost entirely of interviews. I would have preferred a bit more behind the scenes footage. The second documentary, Bletchley Park & Enigma, takes a turn away from the filmmaking process to cover the historical context of the picture. Again, this is an interview heavy segment, showcasing the thoughts of the cast and crew on the operations that took place in Bletchley during the war. The most interesting portion of this feature is an interview with an actual Bletchley worker, who explains how the Enigma machine works. Three deleted scenes are also included: Hotel scene with Puck and Claire, Goodbye scene with Hester and Tom, and Train goodbye scene and shootout. Presented in rather poor quality anamorphic widescreen and Dolby 2.0, these scenes are interesting, if a bit long-winded. It becomes clear why they were cut or abbreviated in the final film. Finally, a non-anamorphic theatrical trailer for Enigma is included, again featuring rather dreadful video quality, and Dolby 2.0 sound. Finally, Columbia TriStar has released Enigma in a sparkling new anamorphic transfer. Even though the new disc contains some quality extras, it does not have as much as one would expect for a special edition reissue. Nevertheless, the excellence of the film, and the other improvements offered make this a worthy replacement of the old, subpar release. Highly recommended.